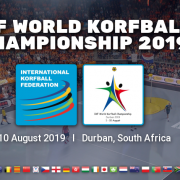 The 11th IKF World Korfball Championship 2019 will take place in South Africa in the city of Durban from 1 till 10 August 2019. The team managers meeting will take place on 31 July. 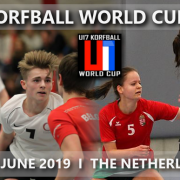 The IKF WKC 2019 will contain the highest number of participants in the history of korfball. 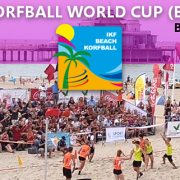 The number of 16 countries during the IKF WKC 2015 in Belgium has grown to 20 participating countries at this year’s edition. The participating countries all have qualified themselves during their Continental Championships in 2018. 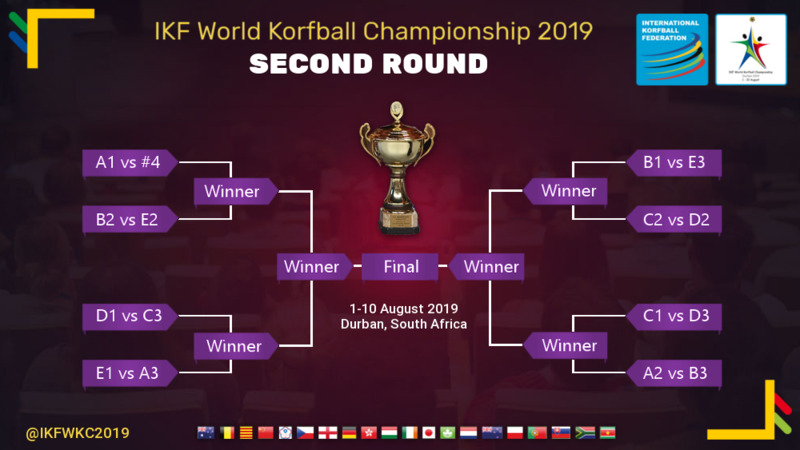 Of the initial 20 countries that qualified for the IKF WKC 2019 the Dominican Republic and Zimbabwe, unfortunately, had to withdraw. While also the first reserve of the Americas (Brazil) was not able to step in, the first reserves of Europe (Slovakia) and Asia (Macau China) have been approached as replacements. Both countries happily accepted the invitation. 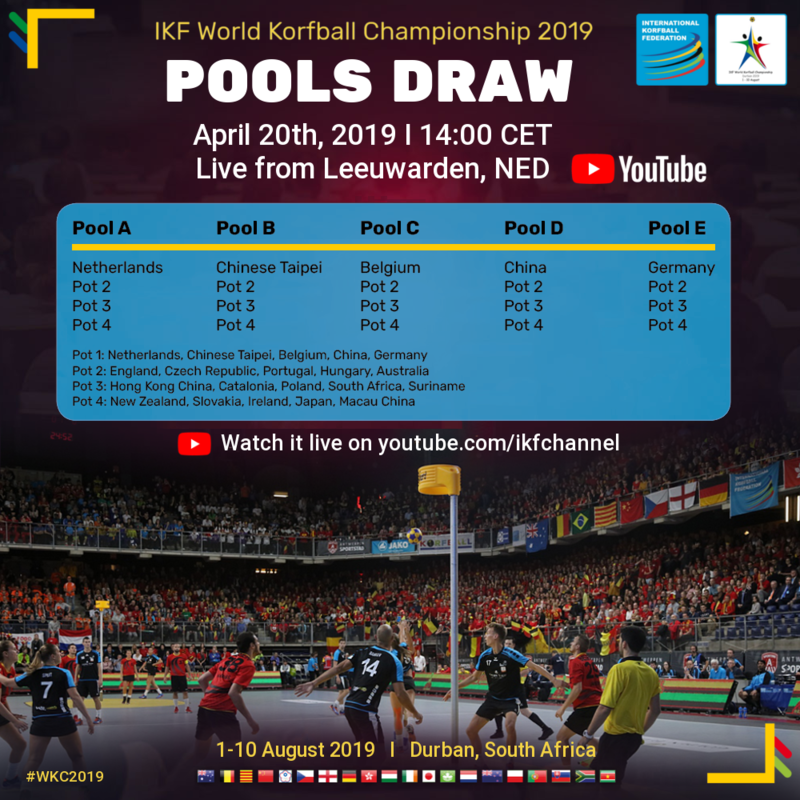 The draw for the IKF WKC 2019 will be held on 20 April 2019 at 14:00 CET during the U19 World Korfball Championship in Leeuwarden, The Netherlands. The 20 countries, divided into 4 pots, will be divided into 5 pools of 4 countries through an open draw. The countries from pot 1 already have a fixed position in the pools. 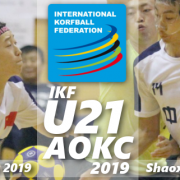 The draw can be followed live through the IKF YouTube channel. 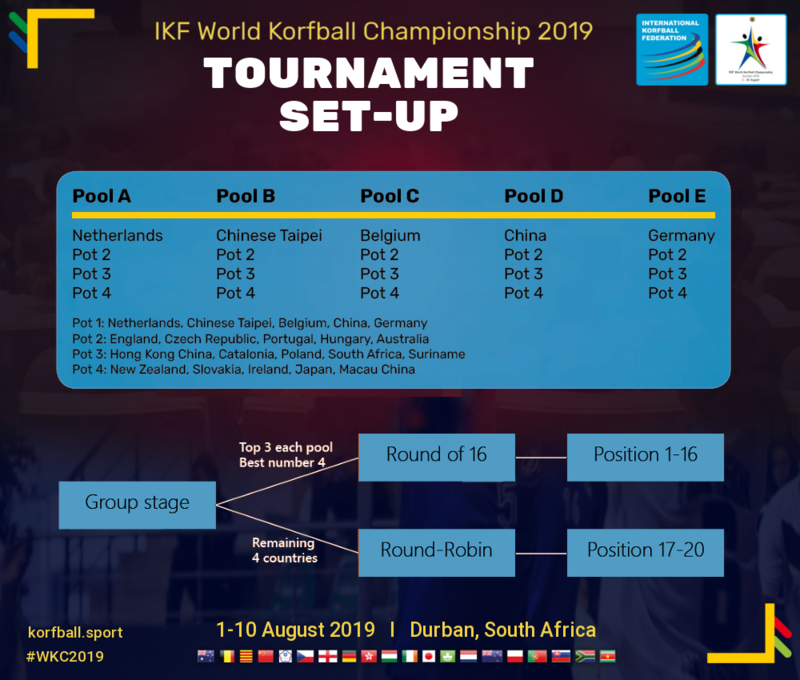 The 20 countries will be divided into five pools by an open draw during the IKF U19 World Korfball Championship 2019, Saturday 20 April 2019 at 14:00 CET. 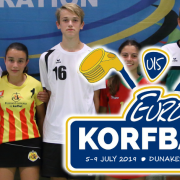 The top 3 of each pool and the best number 4 qualify for the round of 16 (position 1-16). 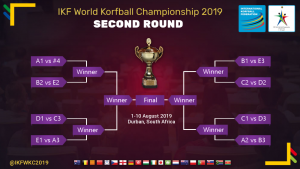 Through a knockout system, where the winners continue to play for the Championship title and the losers for the best possible position at that point, the World Korfball Champion 2019 is decided. 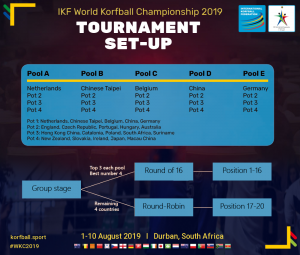 The remaining 4 countries will play in a round-robin system, with a final in the end, to determine their position in the final ranking (position 17-20). 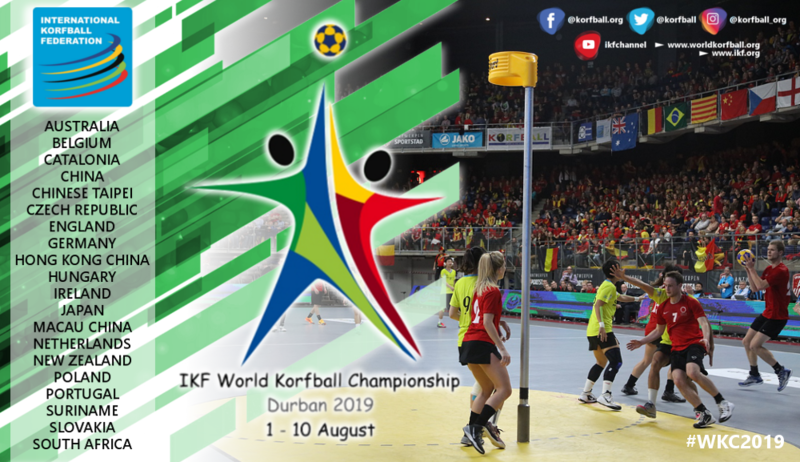 For the first time in the IKF World Korfball Championship history, 20 national teams will compete for the Championship title. *Late withdrawal of the Dominican Republic and Zimbabwe.